The Poor till May, 1795, were farmed by a contractor in Ludlow for £148 a year, but are now maintained partly in a workhouse and partly by out-pensions. There are 17 persons in the house, and 12 families receive 17s. a week. The overseers now find a great deal of trouble in managing their Poor, particularly in the Workhouse, which is under a governess, who is perfectly incompetent to enforce obedience. The Poor seldom obey and often beat her, and even among themselves they have continual disputes. The parish regret the change, particularly as the rates will be considerably higher. The breakfast in the Workhouse is milk or broth, dinner mostly meat and vegetables, supper bread and cheese or milk. County of Radnor: Bleddfa, Heyhop, Knighton (2), Llanbadarn Fynydd, Llanbister (2), Llandewi Ystradenny, Llanfihangel Beguildy (2), Llanfihangel Rhydithon, Llangynllo, Llannano, Stanage. County of Hereford: Adforton, Stanway, Paytoe and Grange, Bampton Bryan, Buckton and Coxwall, Walford, Letton and Newton. County of Salop: Bedstowe, Bettws y Crwyn, Bucknell, Llanvair Waterdine, Stowe. The population falling within the union at the 1831 census had been 8,719 with parishes ranging in size from Stowe (population 147) to Knighton itself (1,259). The average annual poor-rate expenditure for the period 1834-36 had been £4,003 or 9s.2d. per head of the population. Knighton Union workhouse was erected in 1837 at the south side of Frydd Lane (later Frydd Road) to the south of Knighton. The Poor Law Commissioners authorised an expenditure of £1,800 on construction of the buildings which was to accommodate 120 inmates. By the 1880s, the buildings had become dilapidated and inadequate and the workhouse was rebuilt in 1886. The architect for the reconstruction was Edward Jones of Newton and the building work was undertaken by John Williams of Knighton. The location and layout of the reconstructed workhouse are shown on the 1903 map below. 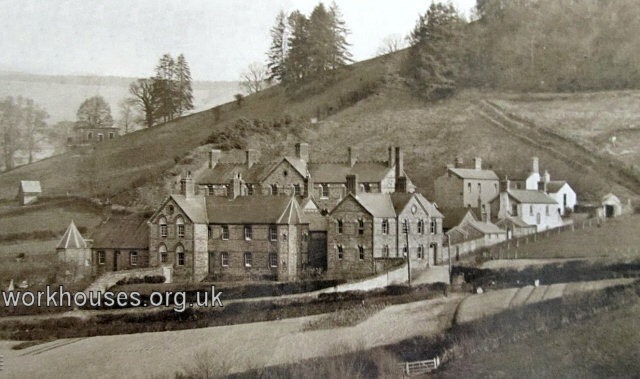 Knighton workhouse from the north-west, c.1916. The the rebuilt workhouse had a rather irregular layout. At the north-west of the site, the board-room block, measuring 48 feet by 23 feet, provided a waiting room and offices for the clerk and relieving officer on the ground floor, with the board-room and committee room above. The infirmary lay to its east, measuring 130 feet by 45 feet and with octagonal sanitary towers at each corner. It contained male and female wards and day rooms, plus WCs, baths, and nurses' rooms. To the south of the infirmary, the main block was 121 feet by 21 feet and three storeys high. 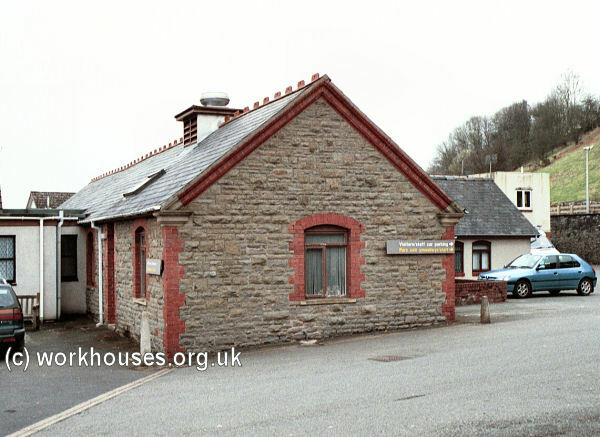 Knighton new board-room block from the north-west, 2000. In December, 1907, the workhouse was the scene of a major gas explosion which made the slightly unlikely subject for a contemporary postcard. Knighton workhouse gas explosion, 1907. During the first World War, the workhouse served as as Red Cross Hospital. 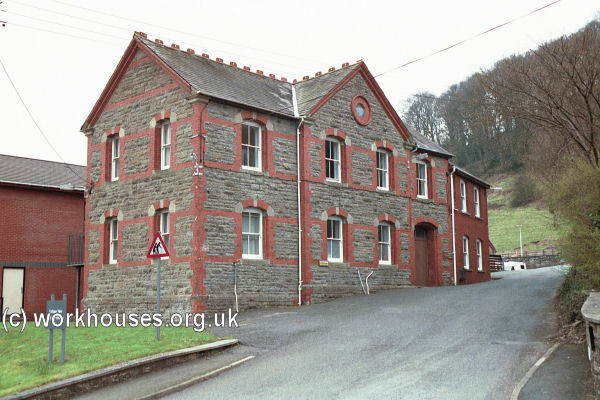 By the 1920s, the workhouse was officially known as Offa's Lodge Poor Law Institution. After 1930, the workhouse became a Public Assistance Institution, then after 1948 it joined the new National Health Service as Knighton Hospital. The site is still (2000) occupied by a local hospital but most of the old workhouse buildings have now been replaced. Powys County Archives Office, County Hall, Llandrindod Wells, Powys, LD1 5LG. Relatively few records survive — holdings include: Guardians' minute books (1901-30); Ledgers (1922-30); List of paupers (1838); etc.